Remove mixture from heat; stir in sugars and salt, then eggs, and finally flour, stirring just until combined. Spread batter evenly in prepared pan. Bake until a toothpick inserted in center comes out with moist crumbs attached, 30 to 35 minutes. Remove from oven, and sprinkle with remaining chocolate chips, then marshmallows and nuts. Bake until chocolate is shiny and marshmallows are puffed, about 5 minutes. Cool completely in pan. Using paper overhang, lift cake onto a work surface; cut into 16 squares. 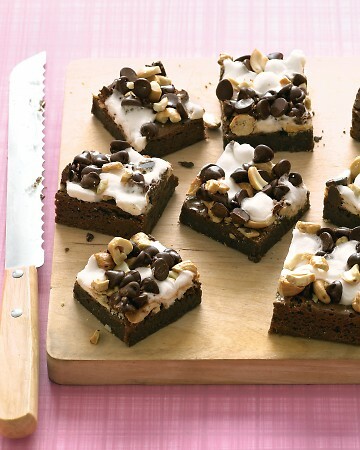 To prevent toppings from sinking into the batter, sprinkle them on after brownies are baked. An extra 5 minutes in the oven melts the topping together for easy slicing.